Over the past couple of days, I have been trying to access Gmail in Chrome by navigating to https://gmail.com. 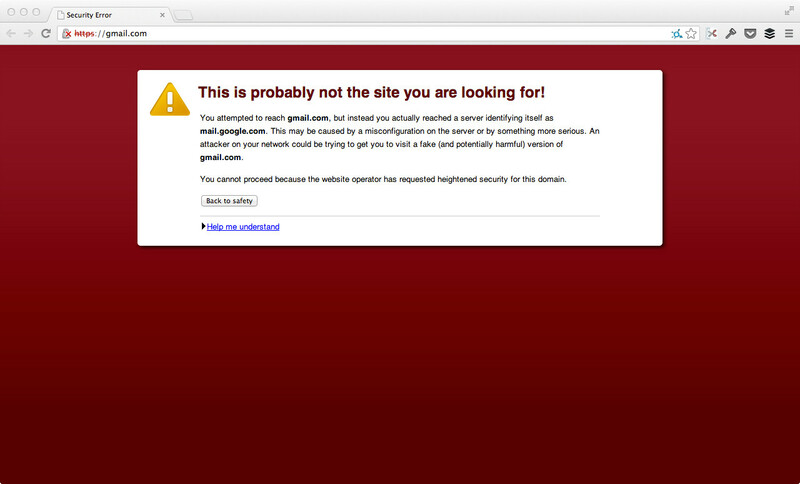 As seen in the error below, it says the server identifies itself as mail.google.com not gmail.com. Makes sense, right? I can type mail.google.com into Chrome and use Gmail webapp just fine but typing gmail.com returns the error attached. Gmail.com and mail.google.com work without problems in Safari. My certificates in Keychain Access seem ok but I do not know much about how they work. I figured out what was preventing me from accessing Gmail via gmail.com. avast! antivirus had "Scan secure connections" enabled in the web shield. I disabled that option, which I forgot I had manually enabled earlier this summer. Other antivirus applications like Kaspersky have a similar function that could be doing the same thing. The "Scan secure connections" was also blocking Apple Software Updates via the Mac App Store. Not the answer you're looking for? Browse other questions tagged gmail google-chrome or ask your own question. Can GMail display error messages for SMTP failures? What other settings could prevent the “Go to Label” feature working in Google Mail? How can I log directly into Gmail when I am also signed into Google Apps? How do I set default accounts for YouTube and GMail?